On the morning of Dec. 16, the famous Otako takoyaki (octopus dumplings) stand in Osaka’s thriving Dotonbori district finally pulled up stakes under pressure from municipal authorities, who were set on removing the stand later that day. The stand had been doing business at that particular location since 1972 and was a certifiable if not necessarilly certified local landmark since it was actually featured in an official tourist brochure for Osaka. However, Otako has always been squatting; that is, using public property without permission. And it might have gone on using the small patch of concrete near the entrance to Tazaimon Bridge in perpetuity if it hadn’t tried to take advantage of an obscure legal principle. Though Otako didn’t invent takoyaki, its funky, makeshift image characterized the snack as being peculiarly Osakan and thus came to represent it as a local “soul food” establishment that was famous nationwide. The brochure only clarified an established fact: Otako was a popular tourist attraction. Its squatting was therefore tolerated by the city, and it’s not entirely clear why the owners decided to go to court and try to gain title on the property they occupied. Perhaps they were feeling pressure from neighbors, who for years complained about the lines of people buying dumplings; or maybe they were concerned when the city decided to clean up this particular stretch of the notoriously filthy Dotonbori canal and build a “terrace” walkway along it. In any case, they applied for the right to occupy the land permanently through the application of an arcane legal precept known as shitoku jiko, which translates as “acquisition prescription.” According to this precept, if a party “resides” on a plot of land for more than 20 years and the owner of the land never formally objects, the occupant has the right to apply for title to that land. It seemed to matter little to the owners of Otako that, according to a report in the Sankei Shimbun, more than 90 percent of shitoku jiko claims are rejected. The Osaka District Court not only rejected Otako’s claim but acknowledged that they were occupying the land illegally and retroactively had to pay the city ¥13,800 a month for the previous twelve years. However, the court did not say anything about removal. 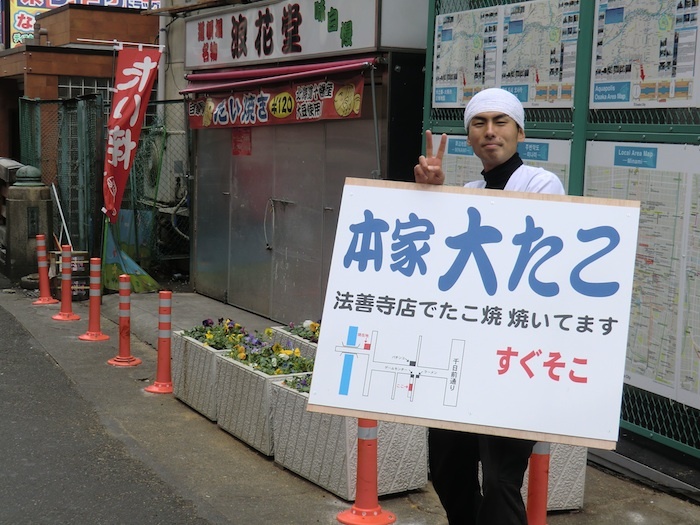 Otako appealed and the High Court not only upheld the District Court’s ruling (with the reasoning that the “location was very good” and therefore it didn’t seem fair that they never paid before), but also said that after paying Otako would have to vacate the spot. Otako appealed again, and the Supreme Court in July confirmed the High Court ruling. At first, the owners were defiant, but in the meantime public opinion seems to have turned against it even as the lines became longer (or perhaps because the lines became longer). Three days before they closed for good, an Osaka city employee who has no occupational relationship to the Otako case but nevertheless obviously feels loyalty to his employer, drunkenly waved his umbrella in a threatening manner in the stand while demanding they pack up forthwith. He was later arrested for “obstructing a business.” The mayor even apologized for his behavior. It hardly mattered. On Christmas Day Otako reopened for business, legally, in a storefront only a few meters away from its old location. Apparently, a former TV producer was saddened by the dispute and brokered a deal between the stand and the owner of a nearby building. What’s a measly seven centimeters?